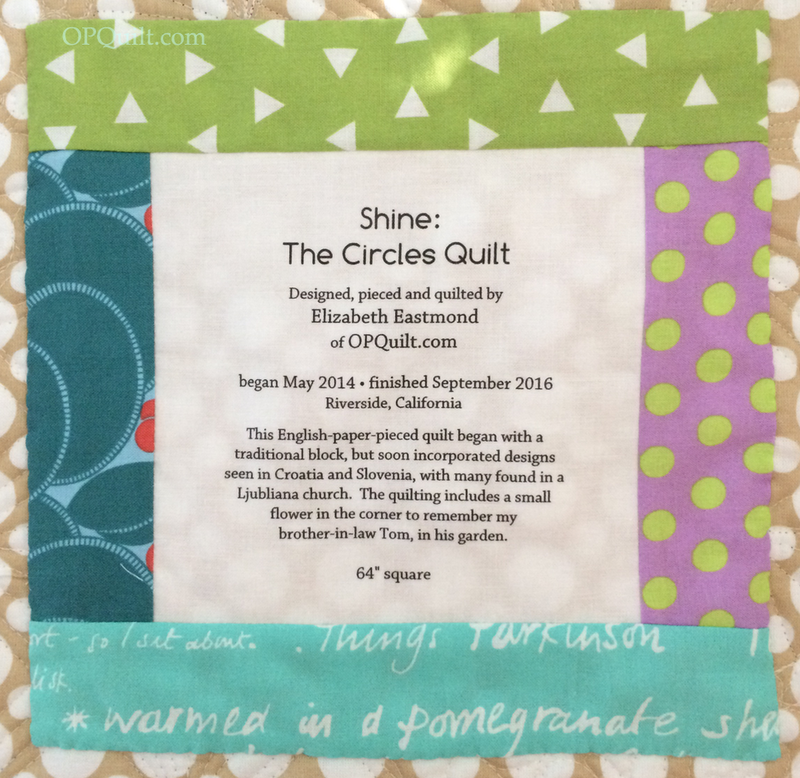 Shine: The Circles Quilt, finished | OccasionalPiece--Quilt! So, so beautiful. 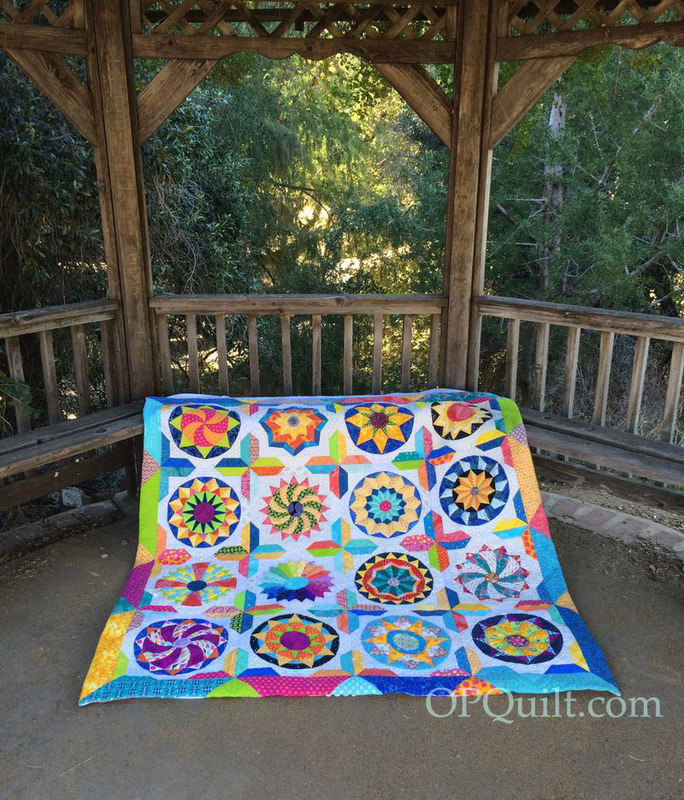 I recently sent my version off to a long-arm quilter, excited to see the results. I started this pattern about 4 months after I started quilting, and I do love how hand quilting marks events in your life. Thank you for this lovely pattern, it introduced me to my love of EPP, and it introduced me to your blog. Wins all around! Oh Elizabeth….it turned out beautifully. I love your sashing technique with those stunning circles. It is a winner all around. I hope your shoulder held up through all of the quilting. 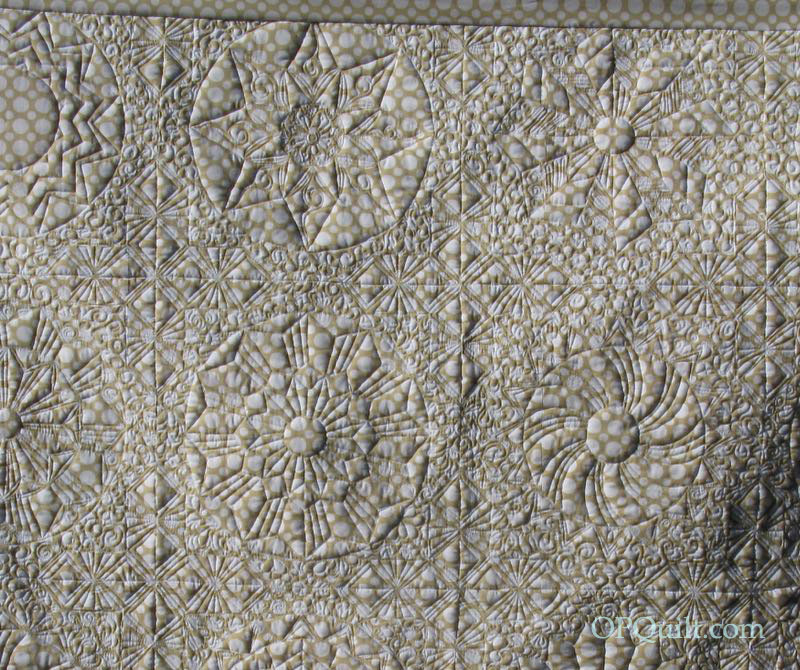 Beautiful quilting, beautiful quilt. You shine! ? Oh, Elizabeth! This is a stunning quilt! The colors, the patterns….just breathtaking! What a beautiful quilt you have created Elizabeth! I admire your tenacity in completing the amazing quilting under such adversity! You must be very proud of it! It is a credit to your creativity and skill! Beautiful. Beautiful. I’m so happy for you getting it done with the bum shoulder and all. A great finish; the border really caught my eye. How striking! Love the colors! You did a phenominal job. You have touched my heart with that corner flower that graces such a masterpiece quilt. Any superlative seems hollow. 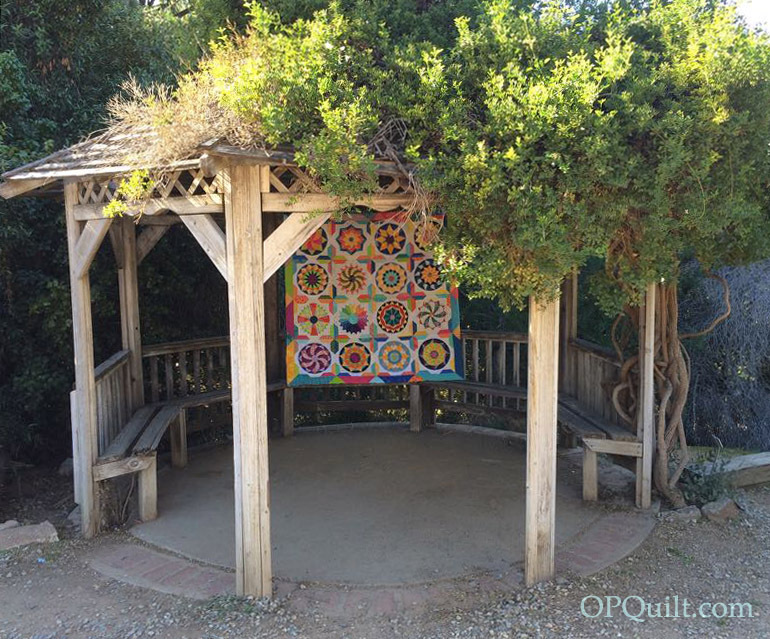 The quilt is a testament of your creativity, skill, determination, and good heart. I will drive down to see it in January. Hang it high! I’m sorry about your brother-in-law. This is a beauty; I love the vibrant colors. When I do two layers of batting, I tend to do a puffy one like wool, and a skinny one like cotton. I’d be intimidated to try two hefty layers; it’d probably be excessive for Albuquerque anyway. Swelter! The quilting turned out beautifully. Love circle type designs. Well done! Congratulations on a stunning finish! This is one of the best quilts I have ever seen. 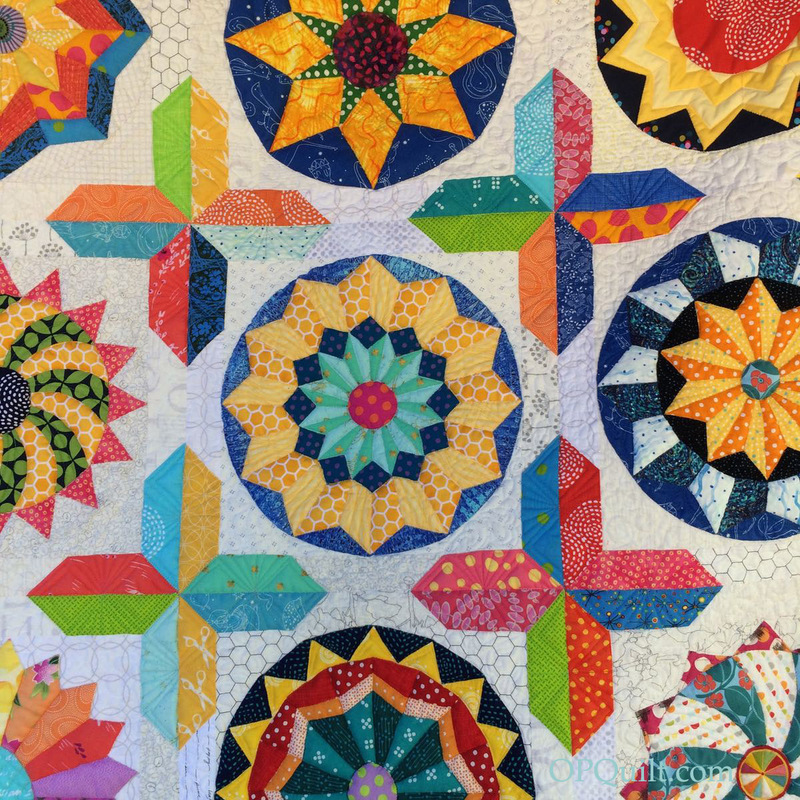 Congratulations on the fabric and pattern choice as well as the wonderful finish – the quilt really shines! Sorry about Tom. I was so sorry to read that you had lost a person who sounded so wonderful. 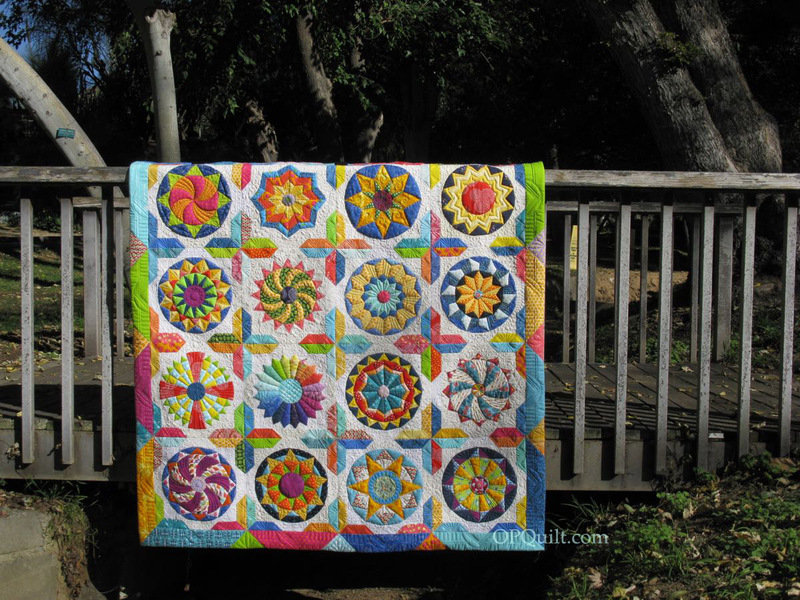 Your flower is a lovely tribute to him and this quilt is just beautiful. I know you are so proud of this – all the thought and love and work that went into it. Love the flower for Tom! Congratulations on such a grand finish – shall we look forward to seeing it in Road to California, maybe? Love this! 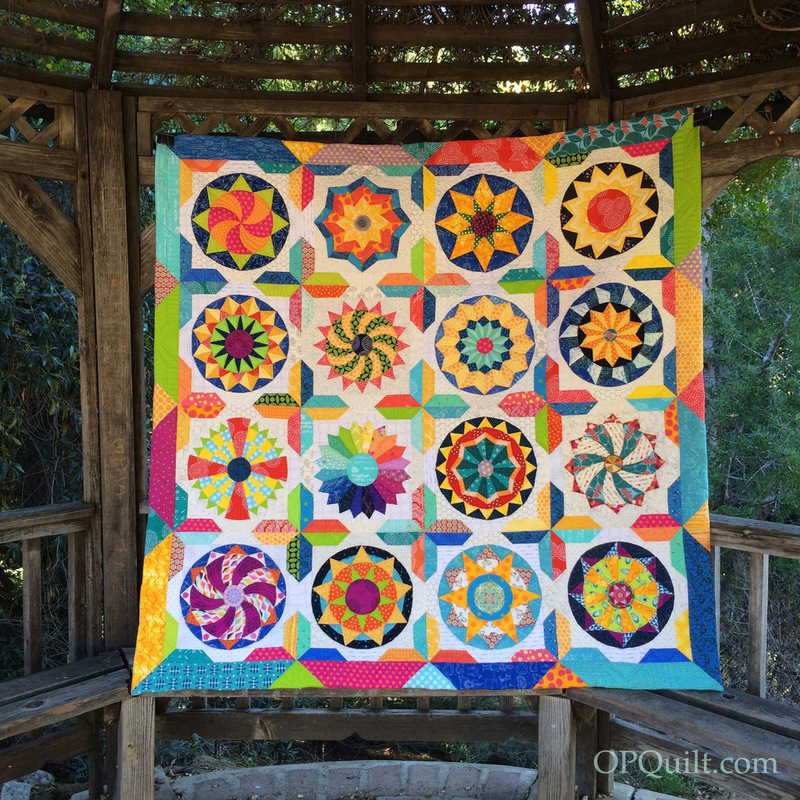 Such a cheerful quilt! Very beautiful. Love the bright sunny feeling I get while looking at it. So sorry to hear of your loss. It is a wonderful extension of your grace, determination, and wisdom. I am spellbound! Beautiful! You have shown me the way to English Paper Piecing. Have finished two of the circles. Quite taxing but also rewarding. This is a long-term project as I plan to stitch these when meeting with my bimonthly quilt group. Thank you for sharing your patterns and tips. I do love this quilt. I will probably never make it, but I have it bookmarked just in case. Lovely finish well worth the effort and discomfort it out you thru. Congratulations it is amazing! 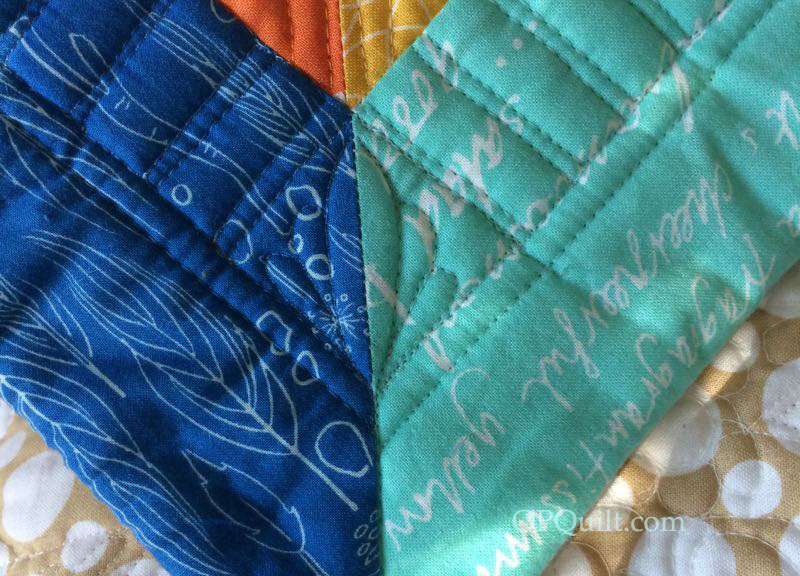 Love the quilt and the quilting – my kind of colors. Are you entering it at Road? This is an absolutely incredible quilt…such a masterpiece! This is such a STUNNING piece of art. What will you do to top this?? 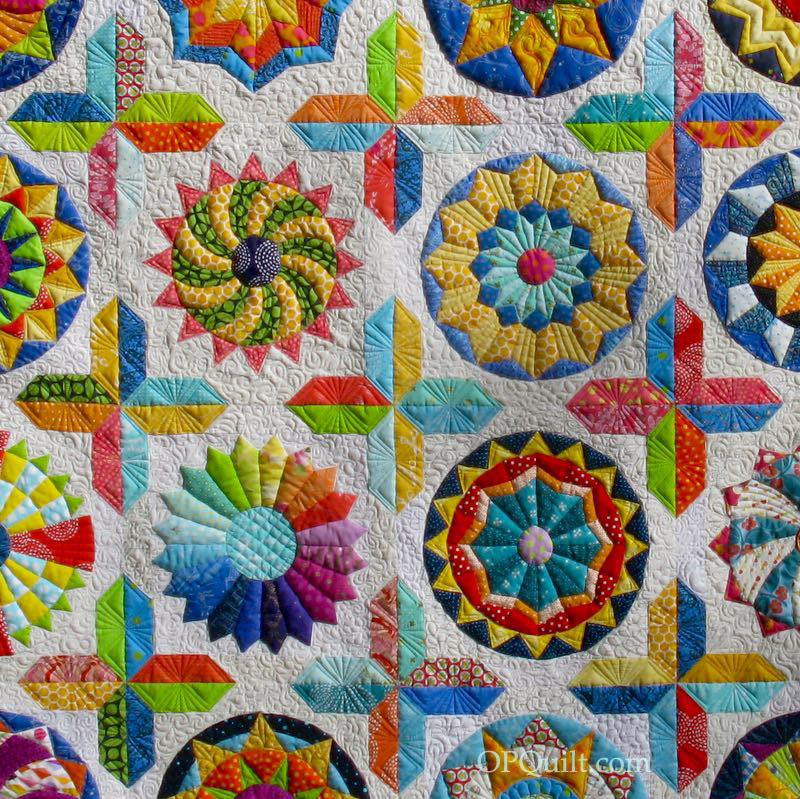 I love this fabulous quilt for its colors and design. 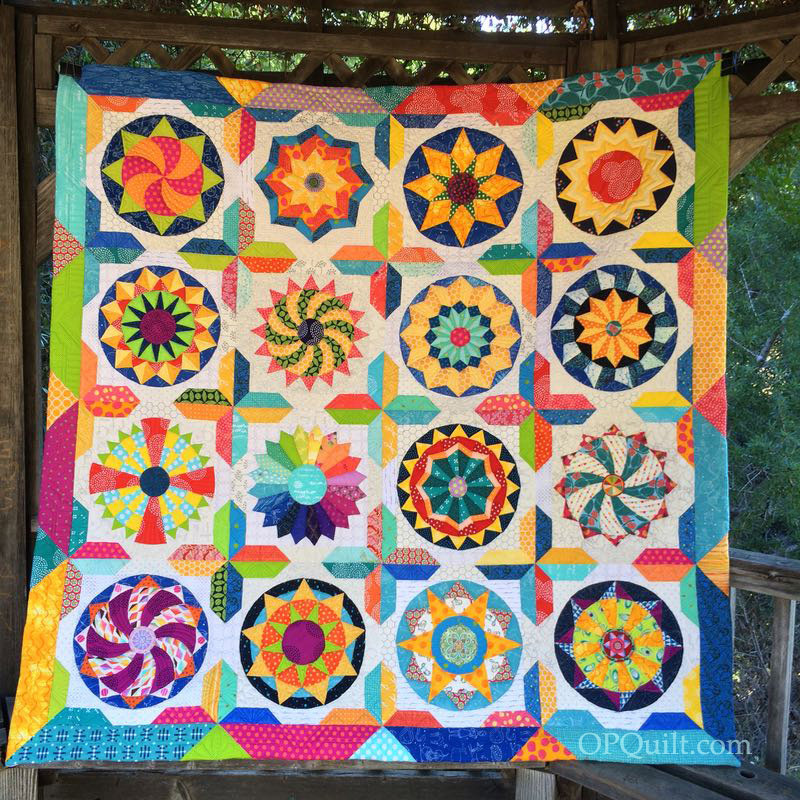 Your thoughtfulness in choosing fabrics, designing a complementary sashing, facing the edges, custom quilting on each circle, even changing thread colors for the flower you added in memory of your brother-in-law makes it all work together so well. Kudos to you! And thank you for sharing it all so generously! Four months of quilting? That is dedication! I am so sorry to hear about Tom. Hi. Great quilt. I love it. And I live in Slovenia.